I am not a movie critic. What I am is a home cook and a consumer of food. As you get to know me, you will learn that my childhood upbringing has deeply impacted my attitudes about food. My grandfather was a butcher in the 1940's and 1950's. I remember the McDonalds jingle, "McDonalds is my kind of place, it's such a happy place" and their plea to look for the golden arches. As kids we so wanted to go to McDonalds. But my grandfather did not allow us to eat McDonalds (and we felt like outcasts). He said with a distasteful look on his face, "It's not real meat - it's worse than horse meat." How lucky I was to have him!! What a sage man. He knew. He witnessed how the meat industry had changed. He was no longer connected to the farmers that provided meat to his shop so he closed his shop. He knew. So, as I sat through the movie, in tears at times, enraged and disgusted at other times, I knew I wanted to write about it. It hit many of my pet peeves like "there are no seasons" in the grocery store and tomatoes are ripened with ethylene gas, not the sun. Monoculture factory farms are horrifying and the treatment of the animals and the laborers beyond words. It made me feel happy and proud about my choices to be a member of 2 CSA's (community supported agriculture), grow a vegetable garden, can and preserve the local harvest, buy local grass fed beef and lamb from farmers that I know on land where I can see their livestock graze. It has also made my conviction about Heirloom Meals even stronger. The US may not have a food culture but most of us had/have a food culture handed down to us through the generations. Dust off those recipes, talk to your grandparents, great aunts and uncles, parents. Let's get back to the home cooked meal with real ingredients. Let's demand that food stores provide those choices. I agree with Gary Hirshberg of Stoneyfield Farm Yogurt - we should all vote with our purchases at the grocery store. Choose organic or locally grown. Choose healthy eating and sharing meals. And demand to know your farmer!! Please see this movie. You can see the trailer here. Eggs-A-Plenty - And Happy Chickens produce Amazing Eggs!!! Why do I tell you all of this? 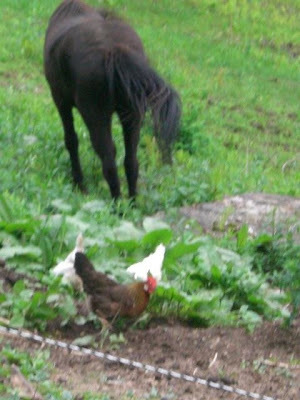 Because real free-range chicken eggs (better stated as "pasture-raised" chicken eggs) are AMAZING!! Their flavor is robust; their yolks the color of the setting sun; and their shapes, sizes and color are all unique. Today is a special day for Mother's and their children. Just preparing this inaugural blog post has brought a flood of tears to my eyes. I grew up in a family where the kitchen and food was the center of the universe, and would ultimately be the place that I am the most happy and comfortable. Of course, I didn't know that growing up. I took handmade food for granted, doting parents and grandparents as a nuisance and their food as overkill (typical kid, right!) Despite that, I was forever in the kitchen, watching and helping Nana making ravioli from scratch, stirring the pots, making sauces and treats because I did really want to be just like them!! So as I navigate through adulthood and have sampled several careers from finance to interior design, it is the kitchen that beckons. And it is a craving for those meals and those memories that has brought me to the development of Heirloom Meals - a soon-to-be TV show/series,cookbook and website that provides a culinary journey into the kitchens and gardens of anyone who has a treasured family recipe(s) with the goal of exploring our diverse culinary history and preserving our ancestors’ tried and true recipes and dining traditions. My goal is to only use local and in season ingredients. We will explore old wives tales leading to some of the great recipes and concoctions and explore the connection between food, farming, the earth, nutrition and family life. This a show dedicated to my grandmother and my mother, my teachers. There wasn’t a day in my life growing up that fresh home-cooked meals were absent. 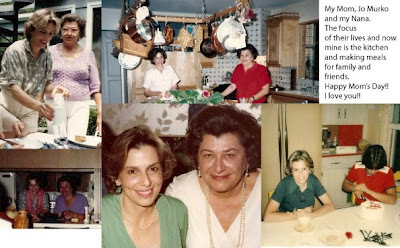 As a very young girl I would stand by my grandmother’s side and watch her make pasta from scratch, roll it out, cut it into ravioli, spaghetti etc, make manicotti crepes that are so light and fluffy you might think they were French crepes – I think there’s an episode here! When I grew up in the late 60’s and even the 70’s there was still a butcher shop where we would go for the freshest of meats and poultry (owned by my grandfather’s cousin, Johnny Pippi) My grandfather was a butcher at one time and before that he owned an apple farm in Claverack NY, which he lost during the Great Depression. My point with all this is that they didn’t teach me per se; - I observed, participated, listened and learned by being part of the process of cooking the family meal. Come along on the journey while I raise the funds to produce the show, write my cookbook, post to this blog and develop the website. And please send me your recipes and stories so I can share them and build them into the content.